The BD BACTEC™ 9000 family of continuous monitoring blood culturing instruments offer superior performance, safety, reliability, ease of use, media quality and service. No other blood culture system has currently demonstrated a shorter protocol or a higher recovery rate than the BD BACTEC™ 9000 Systems. 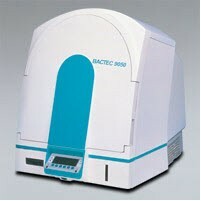 The BD BACTEC™ 9000 System is the only blood culturing system that provides truly non-invasive technology. This means no bottle venting, no dangerous aerosols, and reduced sharps hazards. The exclusive BD Safety-Lok™ adapter permits direct draw sample collection with minimum needle exposure. BD BACTEC™ 9000 System features the unique BD BACTEC™ 9000 fluorescent sensor technology that allows for fully-automated, walk-away testing using a continuous-monitory instrument that agitates and incubates BACTECF Blood Culture Bottles, resulting in earlier detection of positives. The BD BACTEC™ instrument also provides advanced algorithms for individual bottle types, for special circumstances such as low blood volume, pediatric specimens, or to detect slow growing organisms such as Haemophilus and Neisseria. These algorithms provide rapid detection of pathogens in blood culture. Data management systems with barcode scanning capabilities provide rapid entry of bottles into the BD BACTEC™ 9000 series instrument and linkage to patient information. Bi-directional LIS interface eliminates 80% of key strokes for the computer operator and allows personnel on all shifts and with differing levels of experience to quickly master data / bottle entry, thus reducing labor and improving time-to-results. In the BD BACTEC™ 9000 instrument, step-by-step directions for bottle processing and test initiation are provided by scanning the barcode test menu. Patient demographics can be entered into the system using the BD BACTEC™ Barcode Scanner or directly downloaded from the LIS system. They can also be entered via keyboard, if desired. The BD BACTEC™ 9240 System, which accommodates 240 test bottles. The BD BACTEC™ 9120 System, which accommodates 120 test bottles. The BD BACTEC™ 9050 System, which accommodates 50 test vials, features an extremely small footprint (only 4 ¼ square feet of tabletop needed – and no external computer required!) It is suitable for the smaller laboratory: one performing less than 150 blood cultures per month. This unit offers the same technological advantages of non-invasive, continuous monitoring blood culture testing as the larger BD BACTEC™ 9000 systems and is supported by the same full line of BD BACTEC™ media. BD BACTEC™ 9050 operation is based on an easy-to-use icon interface and barcode scanner. System is not booting. I changed the floppy diskette and software floppy and it is still not booting . Can anyone help me out? There are no threads in BD Biosciences BD BACTEC; 9000 Series Reviews at this time.